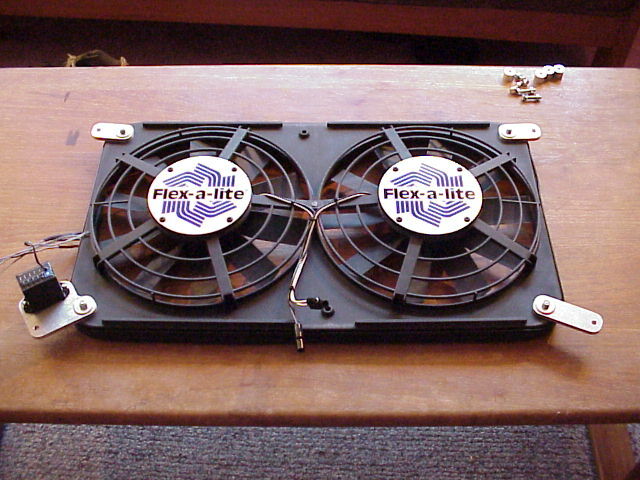 I was asked to test and evaluate a prototype electric fan being developed by Flex-a-Lite. This fan is intended to replace the belt driven fan that is stock on the engine. The idea is that it does two things, frist it reduces the rotational mass of the engine assembly allowing it to accelerate faster. It also reduces the load on the engine from turning the fan. The stock fan is set up so that is will draw a sufficient amount of air through the radiator at low vehicle and engine speed to provide sufficient cooling. However, when the fan is engaged and the engine speed is dramatically increased as in full power acceleration, the fan will be spun much faster then needed and it can consume a great deal of power. I have hear of power consumption figures over 40 HP on some similar sized engines at engine redline. The electric fan will always turn at the optimum speed for cooling and no faster so it will not over consume power. So, by reducing unnecessary power consumption, and reducing the rotational mass of the engine assembly we can fee up more power that can be used to propel the vehicle and increase the overall performance. With this in mind I agreed to test and evaluate the prototype fan kit. The fan fits the radiator perfectly. There are custom aluminum brackets that mount it to the stock mounting points of the stock fan shroud. I used stainless hardware with nylon insert locking nuts so it all will stay put. 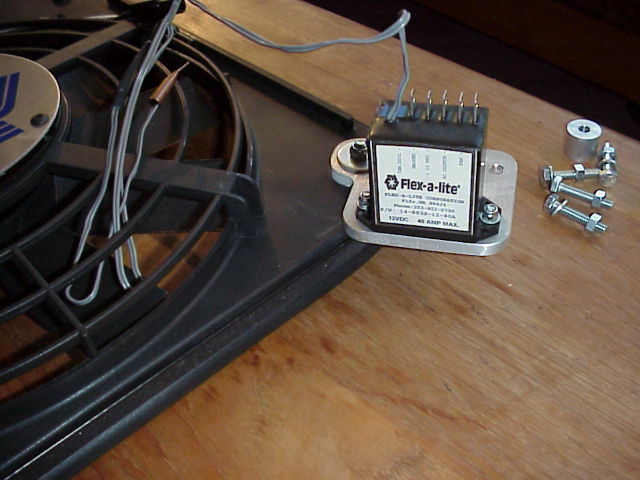 The fan relay is also a prototype unit and I am told it is one of a kind. It has a connection for the A/C compressor clutch so the fan will activate with the A/C compressor, but the unique thing is the temp sensor. You can see it in the picture of the relay on the end of the wire. It mounts to a hole that is on the edge of the radiator. It has a loop in the end and just bolts right to the hole in the lip. It does not penetrate into the inside, get tucked into a hose, or stuffed in between the fins on the radiator so there is never a chance of it leaking. I have never seen this controller on any production fan. Flex-a-Lite has recently released a new controller that can vary the fan speeds and start the fan at a lower speed and increase it as needed for additional cooling. This further reduces load on the electrical system and I am considering an upgrade to it. I can not comment on any improvement in MPG. The engine does feel more peppy, but I make to many mods to know what is really impacting the MPG. Others that have installed this fan have reported a slight increase. A nice benefit is that the fan does not run with the engine is first started liek the stock mechanical fan. When this fan kit made it into production as a vehicle specific kit for the Tacoma and 4Runner, and started hitting the market I saw some things I did not like. First the skimped on the brackets. They are not as nice as the ones you see hear. Next the fan controller is not as nice at all. When you look closely at it it just does not give that high quality feel and it has the temp sensor that you have to tuck inside your radiator hose. Some have reported leaks due to this. Another thing is the price. The vehicle specific fan kit for the Tacoma and 4Runner is priced a lot higher then the generic fan kit. There is just no need for you to spend the extra money on the vehicle specific fan kit. If you want one of these get the generic fan kit. It comes with some fiber filled nylon brackets that will work just as good as the metal ones. You simply have to cut the extra bracket that sticks off of the side of the radiator, that is it and you can save yourself a lot of money on the fan kit.